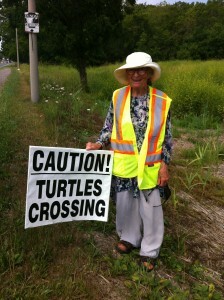 Dundas Turtle Watchers like Joanna Chapman put out this sign when they patrol the roads, hoping to save turtles. Photo by Sue Horner. Nature’s programming is strong. After the first rainfall following spring thaw, Jefferson’s Salamanders emerge from underground dens, determined to migrate to the ponds where they were born to lay their eggs. In Burlington, that means crossing King Road. Some 1,500 cars a day use this road to wind their way up the Niagara Escarpment. The salamanders, small enough to fit in the palm of your hand, have little chance of being seen on the dark, rainy nights they favour for the trip. In 2012, while the City of Burlington was studying King Road improvements, Conservation Halton proposed a radical idea. What about closing a section of road on the Escarpment face for a few weeks to allow this endangered Jefferson Salamander a chance to get to the breeding areas? Burlington agreed, and the closure has been an annual tradition ever since. The King Road closure is an example of road ecology at work. This growing field studies the intersection of wildlife, the environment and roads, and looks for low-cost but effective ways to avoid harming wildlife. Preventing collisions with larger animals also improves driver safety. Road ecology is an emerging need prompted by urban sprawl encroaching on migration and breeding areas. Over the past 60 years, roads in southern Ontario have multiplied from 7,000 km to more than 35,000 km. Some 14,000 wildlife/vehicle collisions happen every year in Ontario. Many more collisions with small reptiles, amphibians and birds go unreported. “It’s a huge issue that’s just beginning to find its way into planning,” says Tys Theysmeyer, head of natural lands for Burlington’s Royal Botanical Gardens (RBG), which includes the Cootes Paradise wetlands. Matich says the environmental assessment stage is the time for municipalities to build in road design that protects wildlife specific to the area. Sometimes referred to as “ecopassages,” wildlife fencing, bridges and culverts are best practices used in Banff and Jasper, Alberta and elsewhere, but they are relatively new to Ontario. In Milton, Halton Region and Conservation Halton are partnering to install fences in strategic spots and build wildlife culvert crossings into the design of the road corridors in several locations, including Tremaine Road. “Culvert sizes vary along this stretch of road, with smaller ones designed to provide passage for mammals up to raccoon size, and larger ones able to accommodate deer,” says Matich. Similar wildlife passages have been installed in other areas of Ontario, including provincial parks like Killbear and Algonquin. In Brampton, two ecopassages protect turtles crossing Heart Lake Road, which bisects a wetland complex. Another two in Oakville help small mammals and amphibians in the North Oakville Natural Heritage System get across Neyagawa Boulevard north of Dundas Street. Turtles are ponderously slow, both in movement and in reaching maturity. They don’t reproduce until they are about 15 years old, if they can make it that long. Seven out of eight turtle species in Ontario are considered at risk, due mainly to road deaths and habitat loss resulting from development. Wetlands on either side of the busy Cootes Drive in Dundas make it a dangerous place to be a turtle. Driven by instinct, female turtles leave Cootes Paradise in June, looking for a south-facing slope to lay their eggs in sandy soil or gravel. Volunteers with a group called Dundas Turtle Watch protect turtles as they cross the road from the marsh to nest, and again when the hatchlings emerge. In 2015, that included 93 turtles killed along the road, plus 57 amphibians and assorted birds and snakes. The group relays the data collected to the Royal Botanical Gardens. Starting in 2014, the data also goes to Ontario Nature, which tracks the distribution of reptiles and amphibians across the province. Hamilton Conservation Authority (HCA) is working closely with Dundas Turtle Watch and the RBG to make change happen, including lowering speed limits and adding warning signs. RBG also installed silt fencing – fabric staked to the ground that prevents animal movement and soil erosion – at hot spots along the Cootes Paradise side of the road in 2012. Permanent fencing followed in 2015. 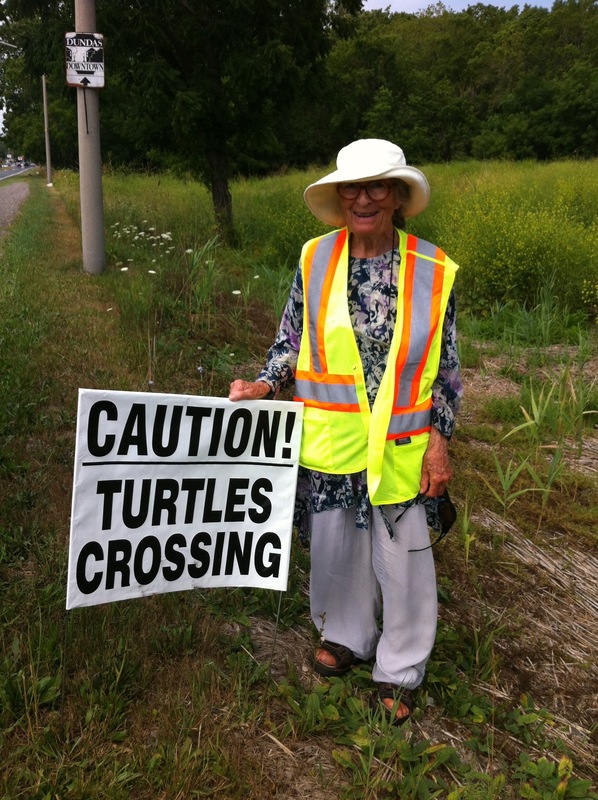 Lesley McDonell, terrestrial ecologist for HCA, says, “We’re fundraising with various organizations to install a low-profile fence along Cootes Drive that’s the Cadillac of animal exclusion fencing.” The knee-high fence has a tilt on top that prevents turtles from getting over. McDonell adds that “a whole group” is working on the Cootes area, including Conservation Halton, Hamilton Conservation Authority, City of Hamilton and McMaster University. “There’s a push to take this road ecology project in Dundas to the larger city of Hamilton, and to other parts of Ontario,” she says.